A dark urban fantasy by Dave Gilbert, creator of the Blackwell series. 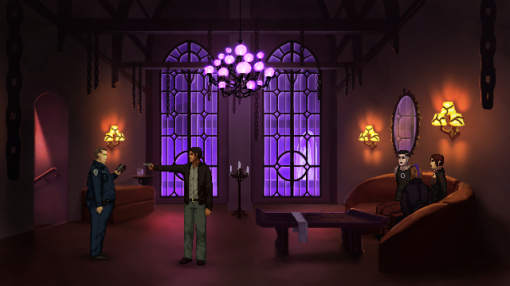 I confess to being a fan of Wadjet Eye Games’ previous work, particularly the Blackwell series. So when I heard that their latest supernatural adventure Unavowed was finally nearing completion, I jumped at the chance to play the preview version available. The press demo is approximately one-third of the total game, and while not a completely polished and finished product, it offers a pretty good sense of what’s to come in the final release. I know it’s usually unwise to judge a game part-way in, but so far I am completely blown away. 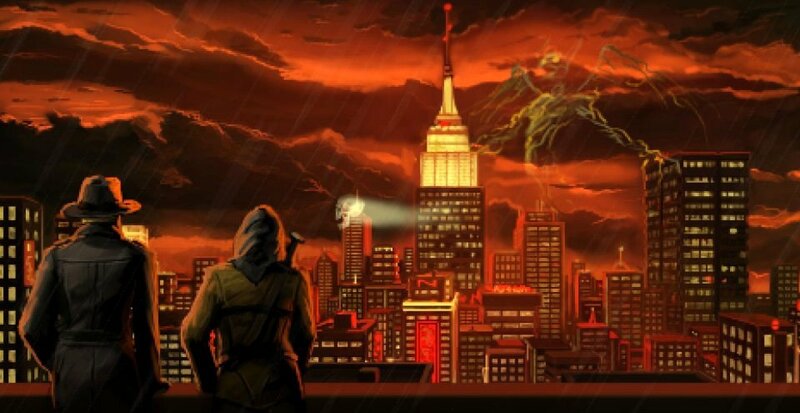 Unavowed is the story of the titular organization and their fight against supernatural crime in New York City – specifically, their efforts to clean up the havoc that the formerly-demon-possessed protagonist wrought after inadvertently touching a cursed book a year earlier. Who exactly is it you play? Well, that’s actually up to you. You can decide if you want to play as a male or female character, and during the successful early exorcism that frees her (or him) of diabolical control, you get to choose from one of three playable backstories – actor, bartender or cop. On my first playthrough, I chose to play as a female actress and for my second I was a male bartender. Initially it seems like the backstory has only a small effect on the present-day plot. No matter your former profession, it turns out you’ve acquired useful skills for your work in the Unavowed. More importantly, under demonic influence you’ve caused the same level of destruction. What became clear on my second playthrough, however, is that your chosen history has ramifications for your ties to the supporting characters, particularly the new members of the Unavowed whom you recruit throughout the game. Playing as a bartender who worked at the regular joint for a now-recovering alcoholic is a vastly different experience than playing as an actor who has no explicit experience with alcoholics. This choose-your-own-adventure way of shaping the story is a refreshing change from many adventure games that are more or less defined by their predetermined protagonists. Not that I don’t love Guybrush Threepwood or Nancy Drew, but choosing your character is a different flavor of game. 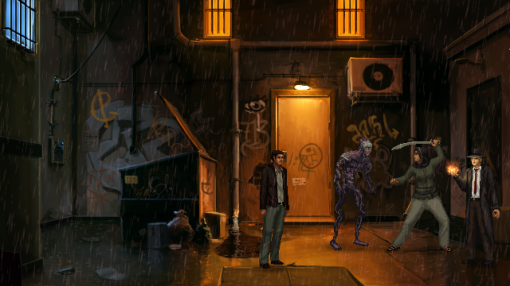 As is fitting for a game set in New York City, Unavowed’s character roster is incredibly diverse and wonderfully compelling. 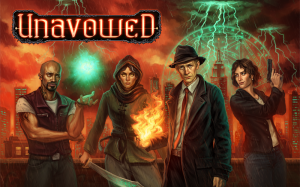 The three starting members of the Unavowed are Fire Mage Eli, half-djinn and half-human Mandana, and her father and leader of their branch of the organization, Kalash. Each character fits into a comfortable archetype at first: Eli is the hot-headed wizard, Mandana is the calm and even-tempered warrior, and Kalash the wise leader. But as the game goes on you discover the layers behind each of them, like Mandana’s issues with her mother, Eli’s family history, and Kalash’s uncertainty about New York. In the demo I also met two (and a half?) other characters who joined the team: Bestower, aka psychic medium Logan and his glowing ball, tag-along spirit guide KayKay, and tough-talking Staten Island cop Vicki Santina. These two also come with their own strengths, weaknesses and personal baggage. Each point of investigation introduces additional side characters, like the homeless former cult leader Wendy, brainwashed bartender Vinny, and unhappy undergrad Dana. Each person feels real and believable, and as a real-life New Yorker, I can confirm that they represent a valid cross-section of the city. Much as the tourism brochures would have you believe, NYC is not just skyscrapers and Wall Street bankers. The game’s art is gorgeous. 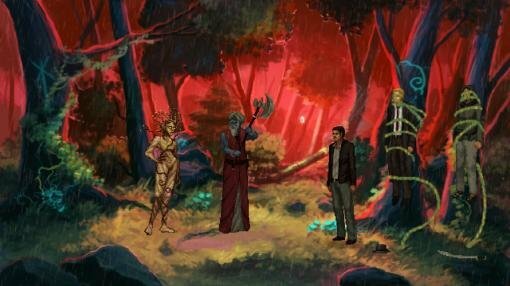 I’ve always been fond of pixel art as a consequence of growing up as a child in the ‘90s, and have previously admired Wadjet Eye’s artistic style, but Unavowed blows all of their previous work completely out of the water. From semi-transparent ghosts to murderous forest spirits, the magical creatures in particular are fantastical with unique designs. Ghosts are still ghosts, but they’re better conceived visually than the traditional under-the-sheet type, with wispy half-skeletons and woeful spots where their faces should be. The forest spirit, who shall remain nameless to avoid spoilers, looks like she is crafted out of tree roots and the animation of her materializing shows her literally her growing out of the ground. The backgrounds are equally well designed, though part of your adventure takes you to some of the more beaten-down areas of New York City, with abandoned and burned buildings that could hardly be called “beautiful.” Still, all of these settings are so evocative. The game takes you all over the five boroughs, from the Bronx and Brooklyn to Manhattan, Queens and yes, even Staten Island. While it’s not the picture-perfect tourist attractions and Central Park duck pond, the game manages to portray NYC as very authentic. My favorite location by far was the grove I visited near the end of the demo, which manages to be as lush, natural and alive as it is atmospherically bleak and somber. Complementing all this, of course, is the rich jazz score and quality voice acting that we’ve come to expect from Wadjet Eye, once again providing an immersive aural backdrop to the action and helping bring the unique characters to life. As good as it looks and sounds, Unavowed’s gameplay might just be my favorite thing about the demo. In addition to the protagonist’s background, the game demands additional decisions in both conversation and actions. Dialogue allows for one of three types of responses, which can range from sarcastic and snarky to sweetly helpful, serious or wisecracking. Thus far all of the dialogue options have led to the same outcomes and haven’t altered the story, though they may yield more information from other characters. Actions, on the other hand, do have more immediate effects. At the conclusion of every investigation, you are given a choice of what to do with the supernatural creature and/or human now at your mercy. The plot continues no matter what you decide, and sound moral arguments are made for each option. The choice isn’t based in a world of black and white morality; it’s more complex and realistic than that. The game also leaves open the possibility that these choices will impact you further on in the story. Everything I played was pure point-and-click. Any of your current teammates are displayed as inventory items from the drop-down menu at the top, allowing you to use their talents and particular abilities in the world. To a certain extent the gameplay is non-linear. After your first mission out with Mandana and Eli, you can then choose which location you want to visit next. However, within each area there is a fairly set order for completing the puzzles. While all of the puzzles I saw were inventory-based and rely on critical thinking, there are a variety of ways to solve each of them depending on who you have in your party at the time. Overall, I found the first six or so hours of Unavowed immensely intriguing. The traditional style of play combined with player choice inherently built into it marks a refreshing change in a genre that often either relies too heavily on the singular personality of a game’s protagonist or sacrifices gameplay for choice-driven narrative. Here there’s always plenty to do, while the characters and story are both engaging and deep, giving me the feeling that I’d only just scratched the surface of what’s to come. These are characters you want to follow to the end to find out what happens to them. Personally, I’ll be eagerly awaiting the full release of this game later this summer. Glad to see its shaping up to be really good. I’ve been eager for this one for a while.